News from LMCU: It’s back! Four years in and we’re back at it, giving $25,000 away to one very lucky entrant! Starting March 1, you can enter at LMCU.org, our Facebook page or in person at any branch. 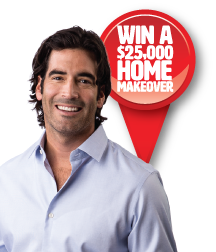 Enter for your shot at a $25,000 cash prize, plus meet home improvement TV host Carter Oosterhouse. Visit LMCU.org to enter, or stop in to any branch location. Some restrictions apply. Enter the Lake Michigan Credit Union $25,000 Home Makeover Giveaway! Anyone can join, anyone can enter, and anyone can win! All entries must be received by 11:59 PM EST Friday, May 27, 2016. Drawing to be held on or around Monday, June 6, 2016. You may enter once a day. Entrant must be 18 years of age and a Michigan or Florida resident. Contest is open to LMCU members and non-members alike. Complete contest rules are available at LMCU.org.